R Series proportional relief valves are designed to protect pressure sensitive equipment by diverting flow in order to relieve pressure upstream of sensitive equipment. R Series valves feature reliable cracking and resealing pressures, leak tight design, and a selection of end connections and seal materials to suit a wide range of applications. The table below estimates the repeatability of set pressure, the pressure at which flow begins, after initial actuation of the valve. 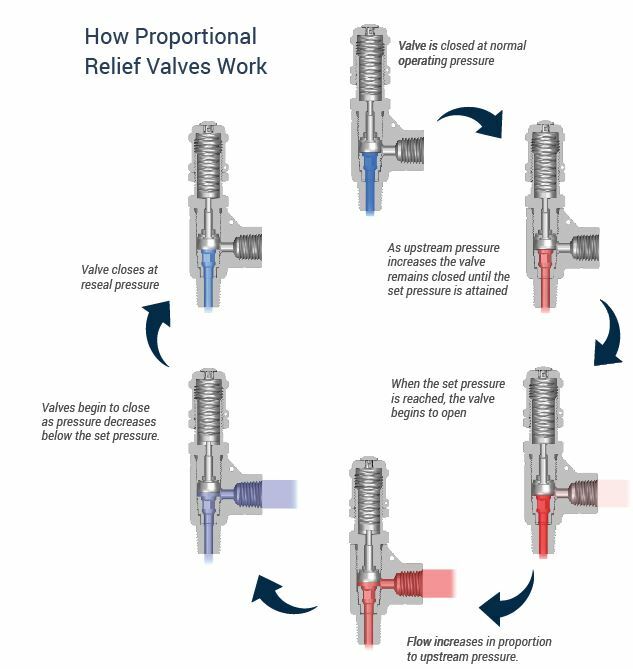 The resealing pressure is the upstream pressure at which the valve closes and flow stops. It is always lower than set pressure. Every R series proportional relief valve is tested for set and resealing performance. 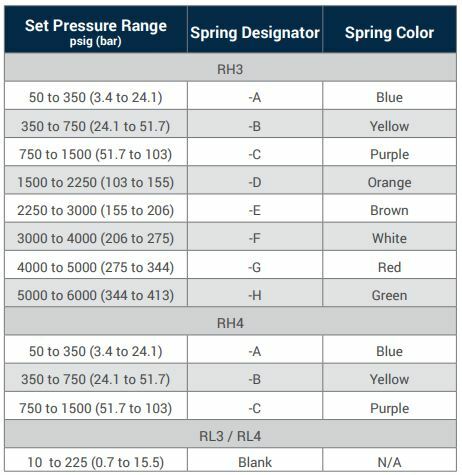 The chart below provides parameters for resealing values within specific pressure ranges. RL Series valves are shipped with springs installed. RH Series valves are shipped standard without springs. Spring kits are purchased separately. Factory set R Series valves are available. Valves are set, tested, locked, and tagged with the set pressure. Certificates of testing are included. A manual override handle allows operators to open the valve without changing the set pressure. Valves are available cleaned in compliance with ASTM G93 Level C and CGA G-4.1, Cleaning Methods and Cleanliness Levels for Material and Equipment Used in Oxygen-Enriched Environments. R Series proportional relief valves are used in gas or liquid systems in upstream and downstream oil & gas, chemical, pharmaceutical and laboratory application. They are often used ahead of pressure sensitive analyzers, flow meters and other pressure sensitive equipment or downstream from pumps and regulators to ensure protection from failures upstream of the relief valves or blockages downstream of the valve. Other applications include test labs, steam cleaning and sterilization systems, heating lines, dispensing and filling systems. R Series valves are designed to protect pressure sensitive equipment by relieving pressure upstream of the equipment. They open when the upstream pressure exceeds the set pressure of the valve. 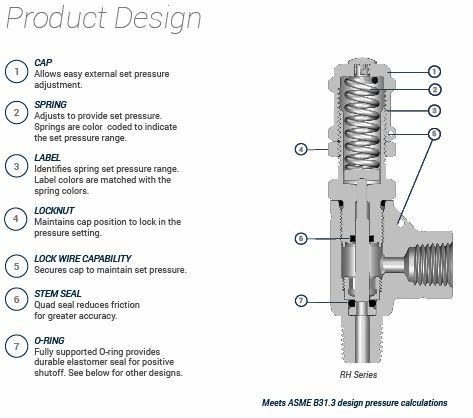 Flow through the valve increases and decreases proportionately in response to changes in upstream pressure. R Series valves reseal at a pressure lower than the set pressure. Once resealed, line pressure can rebuild to it's normal operating pressure. R Series relief valves are available for high-pressure and low-pressure applications. High-pressure, RH Series valves are for applications with working pressures up to 6000 psig. RH3 Series valves have an 0.14 in. orifice and can be set to pressures from 50 to 6000 psig. RH4 series valves have an 0.25 in. orifice and can be set to pressures from 50 to 1500 psig. Standard RH Series valves are shipped without springs. Spring kits are purchased separately. There are eight spring kits for RH3 valves and three spring kits for RH4 valves. Each spring kit is color coded according to its pressure range. Color coded labels, lock-wires and instructions are included with each kit. Factory set valves are also available. RL Series valves are designed for low-pressure applications with working pressures up to 300 psig and set pressures from 10 to 225 psig. RL3 Series valves have an 0.19 in. orifice. RL4 valves have an 0.14 orifice. RL Series valves are shipped with the spring installed in the valve.